It would appear that Maine is an ok state for gambling. The legality of online poker is on the fence, and could be interpreted either way. However, Maine law doesn’t appear to punish players for partaking in said games anyhow. Between that and the fact that home poker games are ok, players have a couple of opportunities for where to play poker. 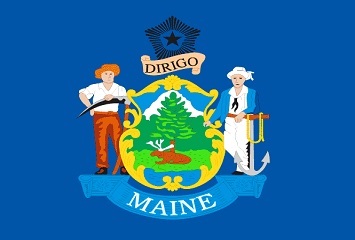 Read on to learn more about what rules you have to follow, as well as the possibility for online poker regulation in the state of Maine. There are no laws that address online poker in Maine. However, computers and related components could easily place online poker under the "Gambling device" or "Illegal gambling machine" statutes. There are no current laws pertaining to online poker or gambling specifically but the courts could punish you under the gambling device laws. Poker is also considered a game of chance in Maine, primarily because of the shuffling of the cards between each hand. Maine law also says that games are considered a game of chance so long as the luck element cannot be eliminated by the skill element. Therefore, poker is considered a gambling activity, and if outside the scope of social or casino gaming, is considered an unlawful gambling activity. That being said -- poker sites still accept residents from Maine. Home poker games fall under social gaming, and are acceptable so long as no one takes a rake, fee or cover charge. "Player " means a person who engages in social gambling solely as a contestant or bettor on equal terms with the other participants therein without receiving or becoming entitled to receive something of value or any profit therefrom other than his personal gambling winnings. "Social gambling " is gambling, or a contest of chance, in which the only participants are players and from which no person or organization receives or becomes entitled to receive something of value or any profit whatsoever, directly or indirectly, other than as a player, from any source, fee, remuneration connected with said gambling, or such activity as arrangements or facilitation of the game, or permitting the use of premises, or selling or supplying for profit refreshments, food, drink service or entertainment to participants, players or spectators. Do Casinos in Maine Offer Poker? Players can participate in poker, as well as a number of table games and over 800 slot machines, at Oxford Casino. Texas holdem, omaha and stud can be played at Hollywood Casino Hotel & Raceway. We receive a lot of questions about state poker laws and the gambling laws in Maine. We thought it would be helpful to post those here. Will online poker be regulated in Maine? It's certainly a possibility -- at least we haven't found anything that would sway us to think otherwise. However, intrastate poker would fail miserably unless Maine could partner up with other sites. Considering New Jersey is on the path to launching their first legal, regulated poker site, Maine will have several local potential partners to choose from. Here is a timeline of events regarding online gambling regulation in Maine. We'll post here as we hear more details. Under this bill nonprofit organizations could hire nonmembers to run poker tournaments (to raise money for charitable causes). A bill was introduced that would allow the installation of 5 video gambling machines inside of non-profit organizations. Establishments would have to pay a $1,000 application fee and $350 annually. This bill passed. Is there an online poker room that accepts players from Maine? Yes. Maine isn't one of those states that US poker sites like to exclude from signing up. So you should have no problem signing up to sites like Bovada, Americas Cardroom, BetOnline or Sportsbetting Poker. What other forms of regulated gambling is offered in Maine? In addition to casino games, the state offers horse racing, a state lottery and high stakes bingo. Where can I read more about Maine poker laws? Here are some interesting facts about gambling and poker in Maine. Shuffling of the deck is enough to qualify poker as a game of chance. The legal age to gamble in Maine is 21, whereas in the majority of other states the legal age is 18. The Penobscot Tribe has offered high stakes bingo in Maine since 1973, making it one of the oldest Indian commercial gambling establishments in the USA. In fact, they opened 15 years before the passing of the 1988 Indian Gaming Regulatory Act. The first numbers in the Maine State lottery was drawn on 6-24-1974. The prize was $20 and the numbers were drawn from a gumball machine.